Tier 3 gene design and cloning strategy. (a) Gene Composer design-session window, showing the target amino-acid base construct in green (middle window) and the structure-guided construct-design products in gold (bottom window). (b) Polymerase Incomplete Primer Extension (PIPE) cloning strategy used for this tier of SSGCID pipeline production. 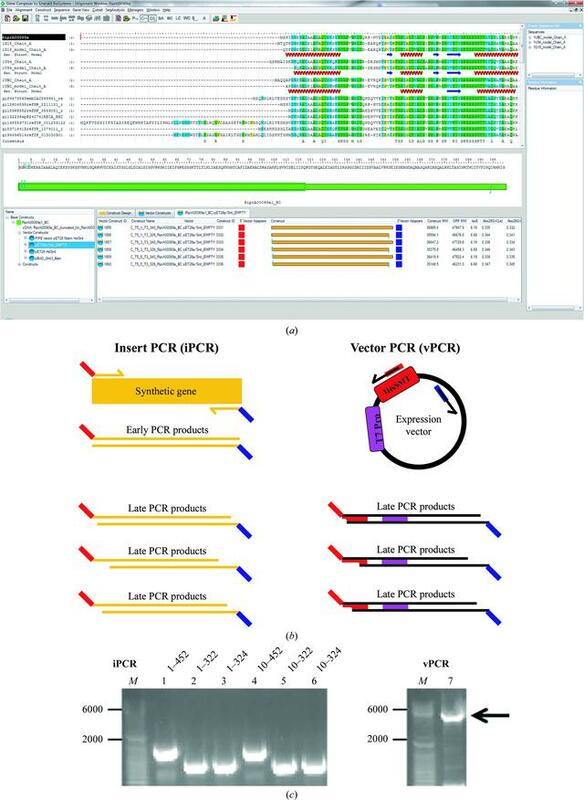 Insert PCR products are amplified using primers with homology to the vector termini (shown in red and blue). Vector PCR products are amplified by primers with homology to only the vector termini. (c) Agarose-gel analysis of insert PCR (with target amino-acid numbering) and vector PCR products.